In April 2017, the voters in the Pardeeville School District passed a $12 million referendum to provide improvements and an expansion to their High School. GEC’s Design Team, lead by Architect Richard Smith, will be providing the vision for this community-shaping project. 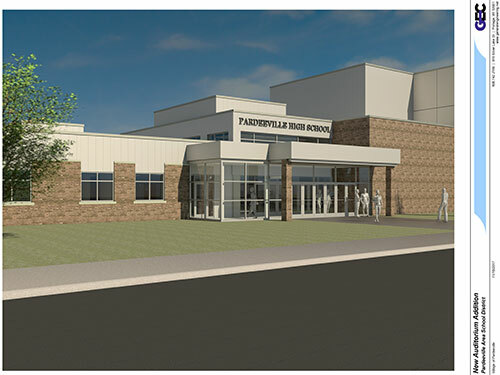 The expansion of the Pardeeville High School is mostly dedicated to the Performing Arts Department, while additional improvements will include new offices, an expansion of the Art Room, and a new Wellness Center that will also be available to the public. In addition to providing Architectural Services, GEC’s team is also be providing Site Design, Structural, and Plumbing Design services. Groundbreaking is expected Spring 2018.